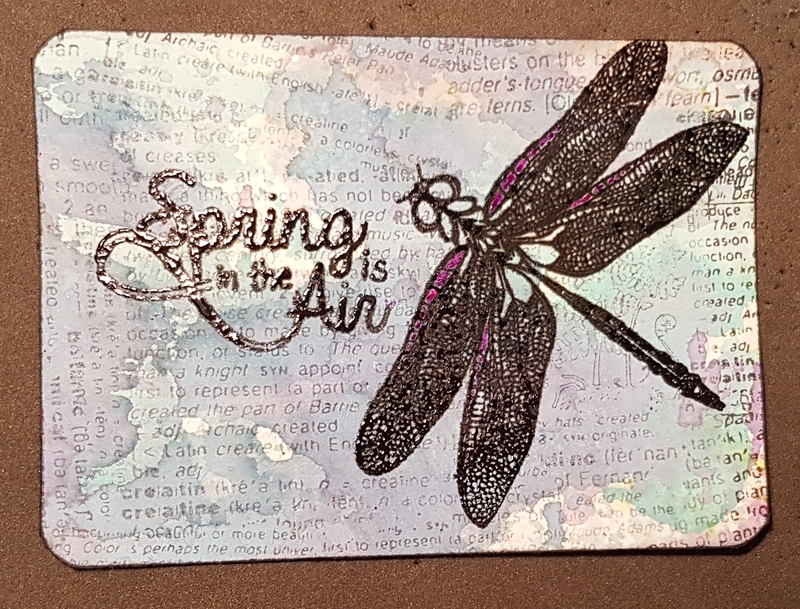 I had missed a dragonfly swap over on the Artful ATC group as it was before I joined the group but when someone suggested a small additional swap I jumped at the chance as I love Dragonflies. 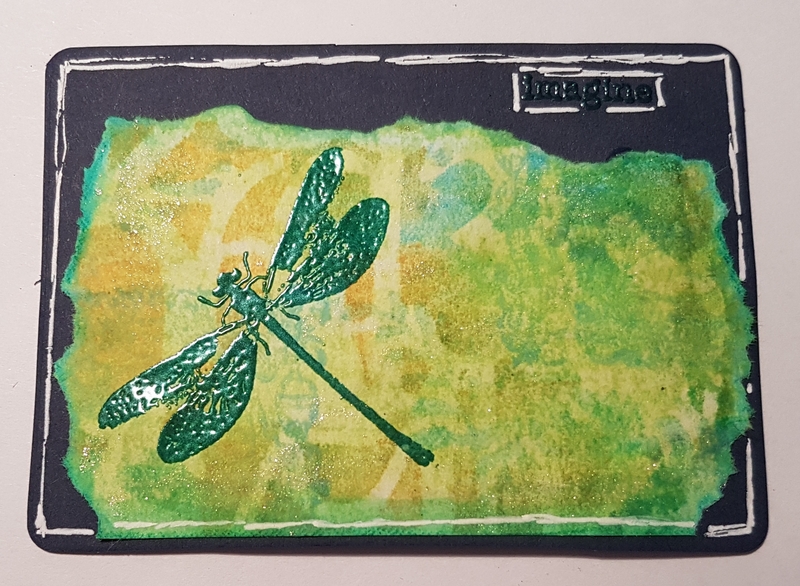 This started life as a scrap from an inky gelli print and had additional distress stains added and then the dragonfly embossed using an emerald embossing powder. Then mounted onto navy and doodled the edge. A distress oxide background which I then added a magazine stamp that has lots of writing scraps on it… Love this stamp a lot. I then then stamped with versafine and partially heat embossed with black fine detail powder. As it only caught part of the image this provides a more ethereal quality to the shine. I did the same with the sentiment. I then added a little gel pen colour to the dragonfly just to add some contrast. 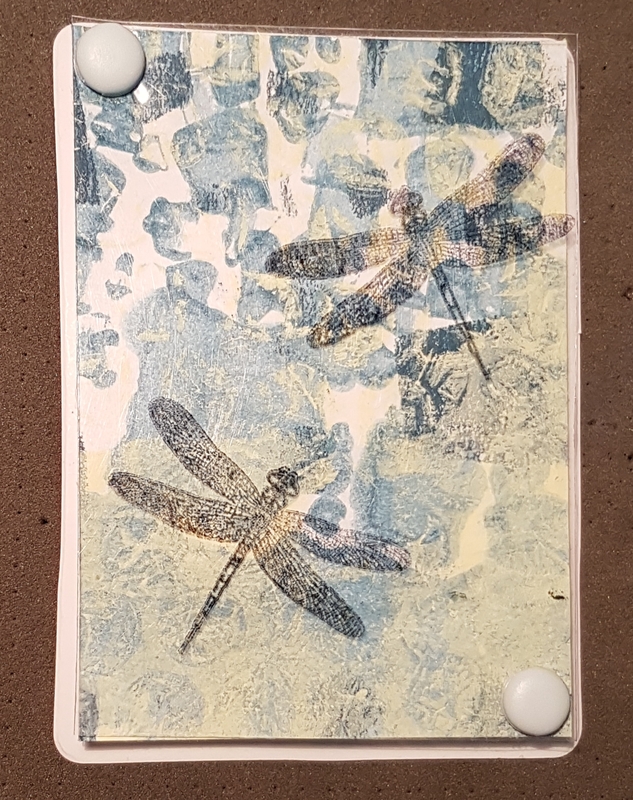 This was a gelli plate painted background that I loved as it was so I added the dragonflies to a piece of acetate using Stayzon and mounted the layers using brads. I then mounted it onto a base with some craft foam to raise it off the back. This is my favourite and yet it is also so simple. Lovely additional swap done and dusted. Distress stains and dylusions ATC 180!!! Gorgeous Catherine! Fantastically artsy backgrounds! This is so creative. Loving the dragonfly theme.